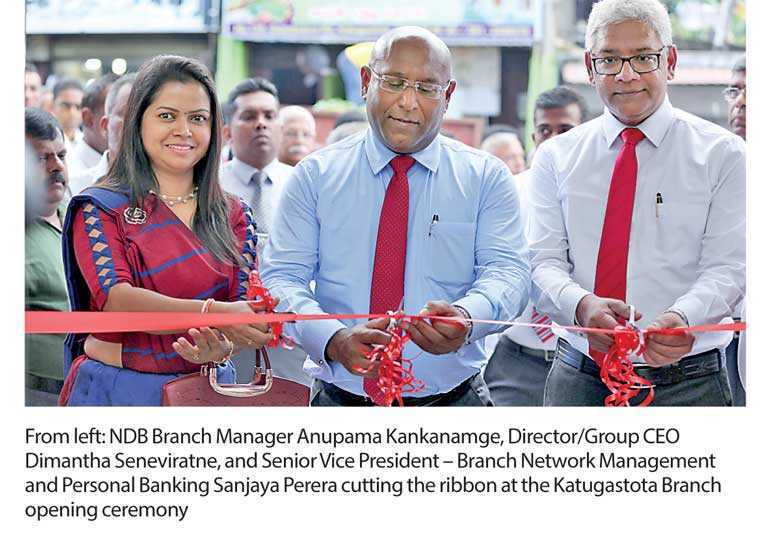 NDB recently opened its latest branch in Katugastota in a bid to support economic and livelihood development in the Kandy District. Accordingly, the NDB branch network has now grown to a total of 108 branches, signalling a steady continuation of the Bank’s expansion strategy. The new Branch was ceremoniously opened by Director/Group CEO Dimantha Seneviratne, Senior Vice President – Branch Network Management and Personal Banking Sanjaya Perera, and the NDB Senior Management. NDB stepped in to Katugastota in a bid to support and encourage the business and entrepreneurial efforts of its people with customised SME financing facilities and advisory services. With its expertise and knowledge in SME financing, the Bank offers many solutions, including short-term working capital loans, supplier and distributor finance, and long-term funding, which will be beneficial to the business community, traders, distributors and other proprietors in the area. NDB pioneers in providing exceptional microfinance solutions for small-scale entrepreneurs, and gives constant empowerment and financial guidance to women. The NDB Katugastota Branch also offers a host of retail banking services, such as current and savings accounts, children’s savings accounts, NRFC/RFC accounts, fixed deposits, housing loans, education loans, leasing facilities, credit and debit cards, and pawning services, coupled with the convenience of internet banking, mobile banking, and a 24-hour call centre so that customers in and around Katugastota will have access to a wide array of banking solutions to help them meet their unique financial needs. Furthermore, an on-site ATM will also be available at the Branch premises for the convenience of the Bank’s customers. The Branch, located at No. 111, Kurunegala Road, Katugastota, will be open from Monday to Friday, 9.00 a.m. to 4.00 p.m.
Anupama Kankanamge will assume duties as the Manager of the new Branch, and her team will consist of Assistant Branch Manager Tharindu Rajakaruna, Menaka Kumari, Salitha Bandara, Nuwani Samaraweera and Eranga Dissanayake. NDB has made considerable strides in the Sri Lankan banking and finance sector, expanding and evolving a range of products and services accessible through its growing branch network. NDB’s performance and customer relations were recognised when the Bank was recently named the ‘Best Bank in Sri Lanka’ by the prestigious Global Finance Magazine at the 25th Annual Best Bank Awards in the Asia Pacific. Further details on NDB’s many products can be obtained from its 24-hour call centre by calling 011 2448 888, or by visiting NDB Bank’s website on www.ndbbank.com.